"Sept. 3, 1988. Chicago's Rizal Center. These were the historic date and setting for the formation of the national organization of Filipino Medical Technologists, PAMET-USA. Delegations from New York, New Jersey and med techs from Texas, Oregon, Georgia joined their colleagues in Illinois in ratifying a new charter and electing the first set of National Officers." PAMET is the acronym of the Philippine Association of Medical Technologists. PAMET has existed for years in the Philippines and continues to be a very active organization up to this day. Some of its members who immigrated to the US formed PAMET organizations in Chicago (1984), New York (1984), and New Jersey (1987). The pioneering set of officers were elected on Jan 14, 1984. These groups functioned independently from the Philippines and from each other. In 1987, PAMET’s incorporation was achieved under the name Philippine Association of Medical Technologists-USA, Inc. It was not until in 1988, that PAMET-Illinois, under the dynamic leadership of the Illinois president, Aida Maguigad, initiated the moves to form a national organization. 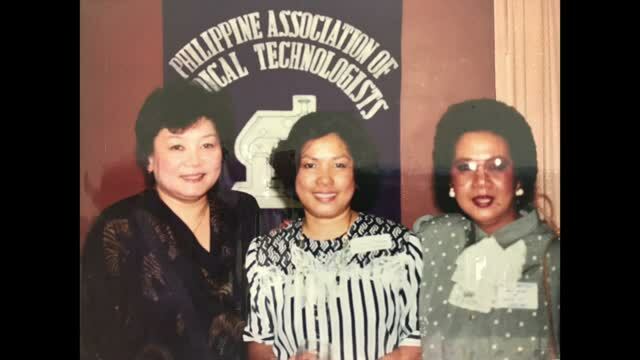 Hence on September 3, 1988, history was made and written for the thousands of Filipino Medical Technologists in the USA and thereby electing Roderico Sumilang of New Jersey as the founding president. During his term progress was swift. In 1989, 2 new chapters joined. These were Northern California and Southern California. By the time of the 1990 National Convention in New Jersey, another chapter was formed in Connecticut. The next 2 years that followed were marked by the consolidation, the success of which was felt strongly at the 1992 National Convention held in Sta Clara, California during the term of the national president Nonie Briones of Northern California.1993 continued to be a period of deeper consolidation, however, member expansion continued at a faster pace than planned. It resulted in 3 more chapters, Texas, Virginia, and Hawaii. In 1994 after the national convention in Long Beach, California, 3 more chapters were added, Michigan, Indiana, and Washington DC during the term of the national president Aida Maguigad of Illinois. Georgia was added after the national convention in Long Island, New York during the term of the national president Precilla Fadul of New York. The last Chapter to be added in the 20th century (1999) was Nevada during the term of the national president Elizabeth Dequinia of Northern California prior to the historic cruise convention at the Mexican Riviera (2000). Sad moments for PAMET-USA in 2001 when then national president Pete Montilla of Virginia tended his resignation during the midst of his term. Leticia Acosta of Northern California was inducted to succeed over the presidency and completed the term till 2002. On Sept 1, 2002 the long awaited national website, www.pametusa.org was initiated and launched during the term of the national president Ricky Martinez of Nevada. The website was created and maintained by PAMET-NV member Virgie Gambon Quintin, who eventually was awarded the most outstanding member (MOM) during the national convention held in Las Vegas. On Feb 15, 2004, the 1st ever national teleconference was hosted by PAMET-NV and conducted by the national president Ricky Martinez of Nevada. In 2005, Leticia Acosta of Northern California, then national president headed the 1st successful medical missions to the Philippines. Florida chapter was formed during the term of the national president Mila Braganza of Northern California. San Diego chapter was formed on June 6, 2010 during the term of the national president Esther Madamba of Texas. During her term, the 2nd medical missions to the northern provinces of the Philippines was successfully held. On Dec 4, 2010, PAMET Sacramento Valley was added and its founding officers were inducted by the national president Nile Alconcel of Michigan. By the time of the 3rd cruise convention to the Western Caribbean in 2012, PAMET-Nebraska was formally added. Before the historic 4th cruise convention to New England/Canada in 2014, PAMET- South Dakota and PAMET-Masachussets were formed during the term of President Evelyn Ramirez. PAMET-USA was also officially recognized as a Continuing Education Provider thru PAMET-NV member Shirley Cruzada by the Professional Acknowledgement for Continuing Education (P.A.C.E.) of the American Society for Clinical Laboratory Science. The term of National president Art Trinidad focused on quality service, practicality, structured meetings and constitutional updates. During the term of national president Shirley Cruzada, Georgia and Florida Chapters were revived, and in 2018, Oklahoma Chapter was added. The PAMET Hymn was adopted, the Aida Maguigad Distinguished Service Award, Elizabeth Dequinia Leadership Award and Bayanihan Plan and Job Placement Program were also established. During her term the 1st webinar was launched and was hosted by PAMET-Nebraska. PAMET-USA, Inc. began with a hopeful journey of 4 outstanding leaders and has become an inspiring movement of 16 active chapters impacting lives, communities and the medical laboratory profession. PAMET-USA, Inc. continues to unify and cultivate Filipino medical laboratory professionals advancing their interests and professional development for service and excellence in laboratory medicine.